5 x 8 inches. 2pp on a single leaf. Pencil on paper. Near fine condition. 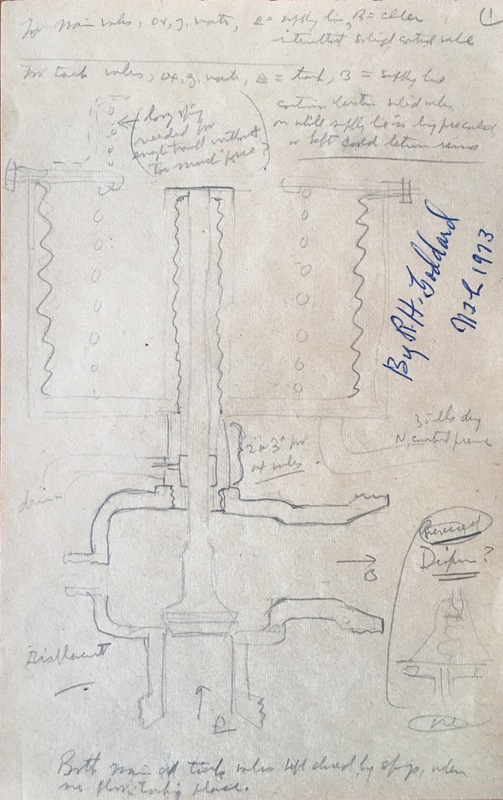 The illustrations and annotations show Goddard wrestling with the problematic design of control valves. One of the early development challenges of launching liquid-fueled rockets was the proper operation of control valves for fuel and oxidizer. Often the valves would fail in tests or during flight with catastrophic results. Proper and continuous operation of the mechanisms was required for Goddard’s rockets to maintain flight until fuel depletion. The modification of the valves represents a breakthrough in scientific technology without which the American space exploration program would not have been possible. Goddard once remarked that such research is a never-ending process, as “there can be no thought of finishing, for ‘aiming for the stars’ is a problem to occupy generations, so that no matter how much progress we make, there is always the thrill of just beginning” (Almanac, 11). Goddard’s contributions to aerospace science cannot be overstated—he was the first scientist who not only realized the potentialities of missiles and space flight but also contributed directly in bringing them to practical realization. This rare talent in both theory and application places Goddard as one of the great minds of the 20th century. This manuscript was preserved by Nils Ljungquist, a machinist who worked with Goddard for decades and who often appears in photographs with Goddard and his rockets. Ljungquist accompanied Goddard to Roswell, New Mexico when the scientist received a Guggenheim grant. Goddard spent nearly a decade in Roswell where he manufactured a rocket “that exceeded the speed of sound and another with fin-stabilized steering, and he filed dozens of patents for everything from gyroscopic guidance systems to multistage rockets” (Time, “100 Most Important People of the Century”). Some of Goddard’s greatest engineering contributions to modern aviation and space exploration were made during this exceptionally productive period. RARE. Goddard’s scientific manuscripts are extremely rare, and apart from the Nils Ljungquist documents, we can trace no others ever appearing for sale. This manuscript represents a unique opportunity to acquire a document that allowed the father of rocketry to lead the emerging science toward the very possibility of space exploration. Provenance: Goddard’s colleague, machinist Nils Ljungquist, with his initialed authentication in ink dated 1973. In the photo shown here, Goddard poses in New Mexico, 1935. 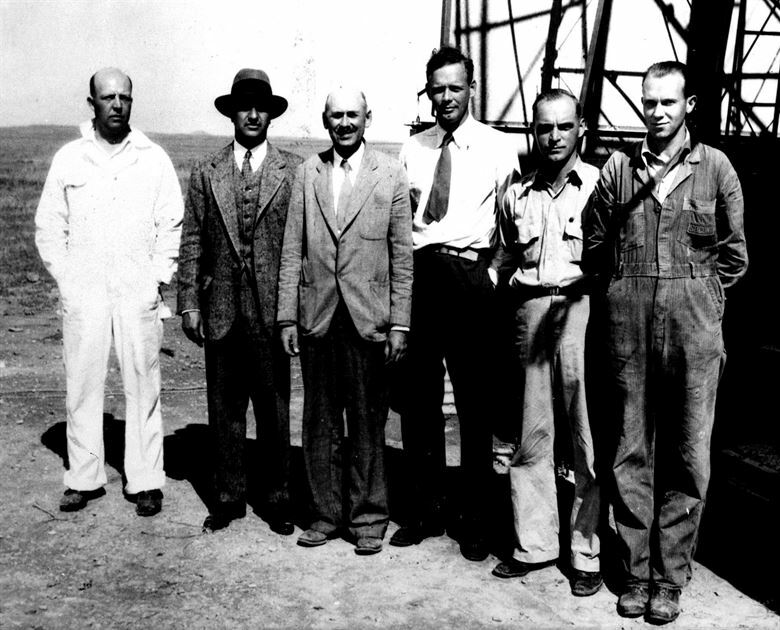 (left to right) Assistant Albert Kisk, financier Harry Guggenheim, Goddard, Charles Lindbergh, and Goddard’s assistants Nils Ljungquist and Charles Mansur.